London is the world’s biggest centre for investment in the minerals industry. Investment banks, pension funds, hedge funds and insurance companies use London stock exchanges to invest in dubious mining projects across the globe. Going by stock value, half of the world’s large mining companies are in some way connected to London – which also makes it an important hub for environmental justice organizations. It was like that at question time at the Antofagasta AGM on Wednesday. Antofagasta is a Chilean company listed on the London Stock Exchange. 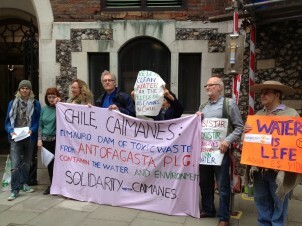 Several activists attended to convey the concerns of mine opponents at Caimanes in northern Chile, affected by the operations of the company’s Minera Los Pelambres copper mine. Local people are suffering because of reduced water supply, contamination of water and the risk of catastrophe if a huge dam containing a tailings (mine waste) pond collapses. There are also worries about damage to important archaeological remains. The company’s response to almost every concern raised was to contradict the information provided and deny that there was a problem – or that if there was, it was not of the company’s making. Us: Why spend so much money on lawyers attacking the people of Caimanes who are only trying to defend their livelihoods in the face of pollution and water scarcity? Them: But we’re not: they’re attacking us – we’re just defending ourselves. Us: Since you built the tailings dam, there has been an 80% reduction in water availability. Us: The remaining water has been dangerously polluted. Us: The tailings dam is poorly constructed and is vulnerable to collapse because of seismic activity. Us: You’re not looking after valuable archaeological finds properly. Us: But you’re breaking Chilean law. Barrick Gold has just had its operations suspended, been fined and suffered a drop in share price because it broke Chilean law. Them: Well… Chilean archaeologists think we are doing a brilliant job.